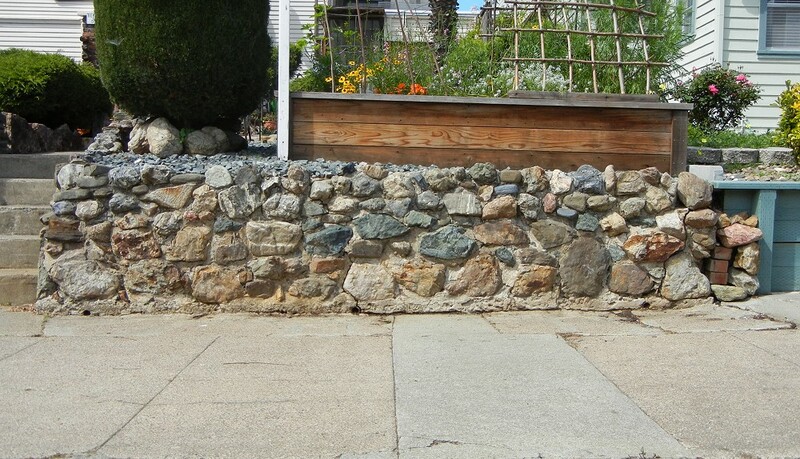 I always get a kick from old walls around Oakland that are made of local stones. This one is on Loma Vista Avenue, in the upper Laurel. Click the image to see a 1000-pixel shot of the whole thing. The mix of blue Franciscan rocks, golden Tertiary sandstones and the occasional reddish chert is distinctive, and it’s nothing that a local landscaping yard would ever offer. Its charm is homely and understated, but authentic. We haven’t had a working quarry in Oakland for many years, so a lot of these walls are old, or rebuilt. Lovers of local stone today have to scavenge what they can from recycled rocks or their own cellar holes. This entry was posted on 31 March 2014 at 9:49 pm and is filed under Oakland stone. You can follow any responses to this entry through the RSS 2.0 feed. You can skip to the end and leave a response. Pinging is currently not allowed.